Ht / Wt: 5'11" / 205 lb. 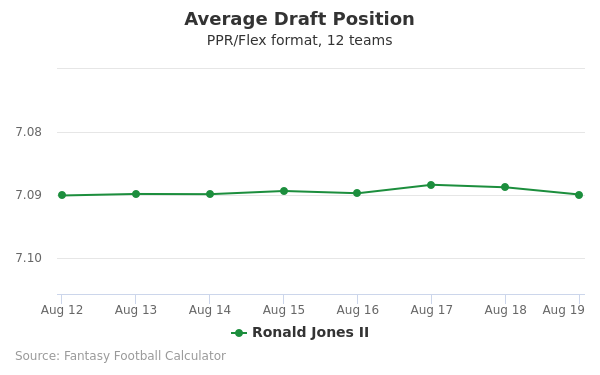 Ronald Jones II's fantasy value is measured by his average draft position (ADP) in fantasy football mock drafts. 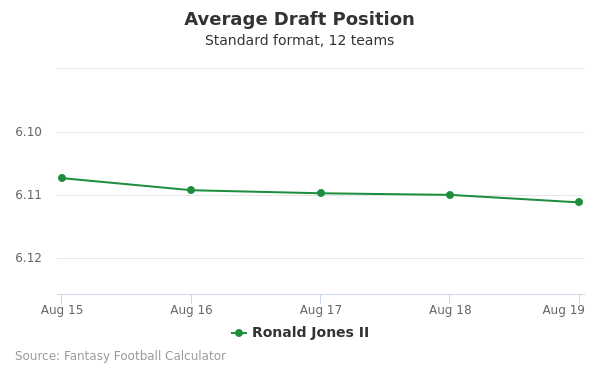 In recent drafts, Jones II's current ADP is 14.05, which indicates that his fantasy outlook is to be the 5th pick of the 14th round, and 160th selection overall. 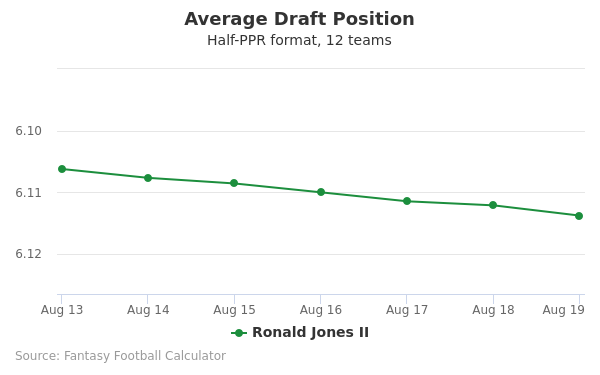 The code below will display a graph that updates every day to show the ADP data for Ronald Jones II for the past 30 days in 12-team PPR leagues. Draft Ronald Jones II or Ted Ginn Jr? Draft Darrell Henderson or Ronald Jones II? Draft Jordan Reed or Ronald Jones II? Draft New England Defense or Ronald Jones II? Draft Chris Herndon IV or Ronald Jones II? Draft Jack Doyle or Ronald Jones II? Draft Nelson Agholor or Ronald Jones II? Draft Derek Carr or Ronald Jones II? Draft Jalen Richard or Ronald Jones II? Draft Marquez Valdes-Scantling or Ronald Jones II? Draft Damien Harris or Ronald Jones II? Draft Matthew Stafford or Ronald Jones II? Draft Giovani Bernard or Ronald Jones II? Draft AJ Brown or Ronald Jones II? Draft Quincy Enunwa or Ronald Jones II? Draft Noah Fant or Ronald Jones II? Draft Philadelphia Defense or Ronald Jones II? Draft Ronald Jones II or Sam Darnold? Draft Adam Vinatieri or Ronald Jones II? Draft Brett Maher or Ronald Jones II? Draft Jamison Crowder or Ronald Jones II? Draft Nick Foles or Ronald Jones II? Draft Ronald Jones II or Stephen Gostkowski? Draft Ronald Jones II or Seattle Defense? Draft Robbie Gould or Ronald Jones II? Start Ronald Jones II or Ted Ginn Jr? Start Darrell Henderson or Ronald Jones II? 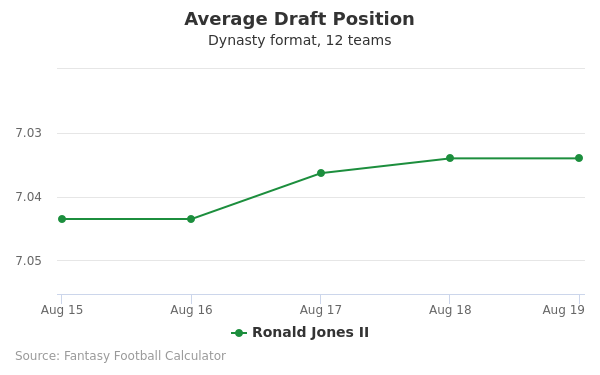 Start Jordan Reed or Ronald Jones II? Start New England Defense or Ronald Jones II? Start Chris Herndon IV or Ronald Jones II? Start Jack Doyle or Ronald Jones II? Start Nelson Agholor or Ronald Jones II? Start Derek Carr or Ronald Jones II? Start Jalen Richard or Ronald Jones II? Start Marquez Valdes-Scantling or Ronald Jones II? Start Damien Harris or Ronald Jones II? Start Matthew Stafford or Ronald Jones II? Start Giovani Bernard or Ronald Jones II? Start AJ Brown or Ronald Jones II? Start Quincy Enunwa or Ronald Jones II? Start Noah Fant or Ronald Jones II? Start Philadelphia Defense or Ronald Jones II? Start Ronald Jones II or Sam Darnold? Start Adam Vinatieri or Ronald Jones II? Start Brett Maher or Ronald Jones II? Start Jamison Crowder or Ronald Jones II? Start Nick Foles or Ronald Jones II? Start Ronald Jones II or Stephen Gostkowski? Start Ronald Jones II or Seattle Defense? Start Robbie Gould or Ronald Jones II?